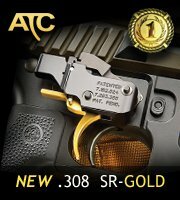 Just spotted this on Brownells. Interesting, inexpensive and reusable tool for proper gas block alignment. Currently only available for .750 barrels but other sizes are coming. 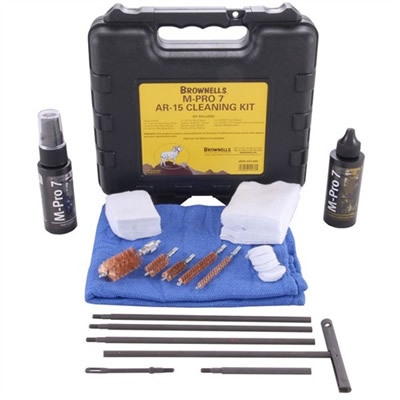 Brownells has teamed up with M-Pro 7 to develop the M-PRO 7 AR15 CLEANING KIT. This cleaning kit specifically for maintaining an AR-type rifle in peak operating condition. Now you can clean your AR using the same operationally tested products used by the United States Armed Forces. Inside the kit’s compact hardshell case you’ll find M-Pro 7 Gun Cleaner that safely penetrates deep beneath even tough, scorched-on carbon fouling to lift away the gunk and leave the bore sparkling clean. M-Pro 7 Cleaner/Lubricant/Protectant delivers superior lubrication and corrosion protection, and can also be used for quick cleaning on the go, when there isn’t enough time for the complete cleaning routine. You get a military-style multi-section steel cleaning rod with a folding handle, plus five high-quality bronze brushes to clean ARs in the standard .223/5.56mm and .308/7.62mm calibers, as well as 9mm and .45 chamberings, plus a brush for cleaning the bolt carrier way—critical for maintaining reliable weapon cycling. There’s plenty of absorbent cotton flannel patches in three sizes to fit all those calibers, plus the M-Pro 7 Weapons Maintenance Guide. Due to its non-hazardous and non-flammable contents, this kit meets TSA regulations for legal transport in checked baggage aboard commercial airliners. SPECS: Kit contains polycarbonate box, black; 2 fl. oz (59ml) Gun Cleaner; 2 fl oz. Cleaner/Lubricant/Protectant; five-section steel cleaning rod w/30” maximum extended length; (4) bronze bore brushes to fit .22/.223/5.56mm, .308/7.62mm, 9mm, and .45; bronze bolt way cleaning brush; polymer patch loop; 1” circular, 2” square, and 2½” square cotton flannel patches; lint-free gun cloth; and Weapons Maintenance Guide. AR-10 308AR AR15 Gas Tube Pipe Cleaners – These extra long gas tube pipe cleaners are designed for scrubbing out fouling and carbon residue from gas tubes on gas-impinging rifles, like traditional AR-10 308 AR AR-15 platforms and variants. These extra-long tube pipe cleaners let you swab the full length of the gas tube. Made with highly absorbent cotton bristles, these tubes are fully functional and can be used for a variety of other applications. Routine maintenance of gas tubes is crucial to a guns performance and shelf life. These are a must have for every AR-10 AR .308 and AR-15 owner. Made for scrubbing out gas tube on gas-impinging rifles like AR-10 .308 AR AR15 and variants (unless converted to gas piston operation). Regular use keeps gas tubes free of fouling and carbon buildup for reliable function and necessary maintenance. Extra-long length for cleaning the full length of the impingement gas tube and other hard-to-reach areas. Specs: wire core, highly absorbent cotton bristle carriers. 16″ long (40.6cm), 1/8″ (3.2mm) diameter. 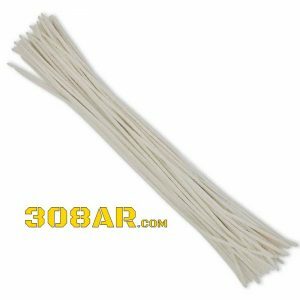 Includes: 50 gas tube pipe cleaners for about $10. 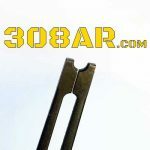 AR-15 and AR .308 Ejection Cover Hinge Pin Clip Tool – There are a couple tricky areas when building an AR-10, 308 AR AR-15 etc. All are pretty easily tackled with special tools and patience. There is one part though rarely mentioned as being difficult but can give a builder fits (especially this guy with missing/short fingers). That part is the tiny c-clip on the ejection port door cover. It’s small and difficult to install with ease. 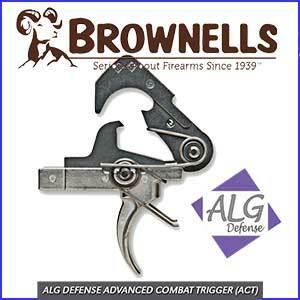 Well the other day I was browsing Brownells gunsmithing tools section of their website when I happened across what they have labeled “AR Ejection Cover Hinge Pin Clip Tool“. It turns out this handy little gem of a tool is from a company called ROTOR CLIP. 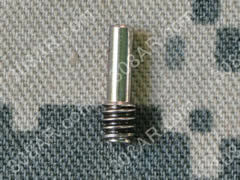 Rotor clip is a manufacturer of snap-rings, e-clips and yes the c-clip of the AR15 Ejection Cover Hinge Pin. 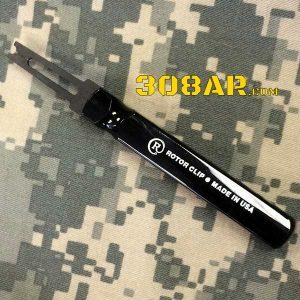 Rotor Clip also manufacturers tools for installing and removing the previously mentioned fasteners.In this case the tool is a C-Clip Installation Tool manufacturers part number is A-300. 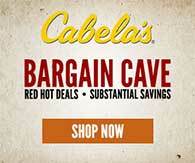 I checked stock at industrial supply houses as well as Amazon and Sears $46 was the going rate, Yikes. 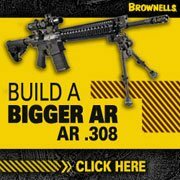 Brownells was half the cost plus I’m an edge member and have those shipping perks. I think tonight I will go home and remove all the c-clips from my ejection port cover pins just to reinstall them just for fun. AR15 Ejection Cover Hinge Pin Clip Tool features split-lip design that lets you easily install ejection cover hinge pin clip. No more c-clips shooting across the room. Just slide c-clip into recess in the tool and snap into place. Squared handle makes it easy to grip and manipulate. 308 AR AR-10 Bolt Catch Pin – The bolt catch pin, one of the smallest parts on the AR 308, AR-10 and AR-15 platform weapons is a part that can stop an AR-10 308AR build dead in it’s tracks if you didn’t purchase the correct one or the correct LOWER PARTS KIT for your STRIPPED LOWER RECEIVER. Here’s why. 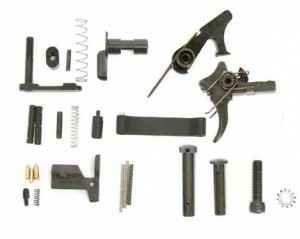 The AR-15 platform uses a roll pin and that’s taken for granted when shooters move up to the AR-10 and 308 AR platforms. Unfortunately this is where the topic gets muddy. Armalite AR-10 rifles use a traditional roll pin setup in the AR-10 lower receiver so their Lower Parts Kits obviously include the pin. If you use an AR-10 LPK on your non Armalite 308 AR you will need to order the threaded “Bolt Catch Screw” seen elsewhere on this page. I typically keep the Armalite LPK’s on hand as well as a few of the bolt catch screws. The Armalite AR-10 utilizes this roll pin, Armalite part number EL0220 which is the same as their M-15/AR15 rifles. Alternatively DPMS LR-308 based weapon utilize a proprietary hybrid pin/screw (mentioned above). The DPMS 308 Bolt Catch Screw is essentially set screw who’s threads have been removed from one end creating a hybrid screw type pin. Now unfortunately though not all DPMS LR-308 platform based LOWER RECEIVERS utilize the hybrid BOLT CATCH PIN. 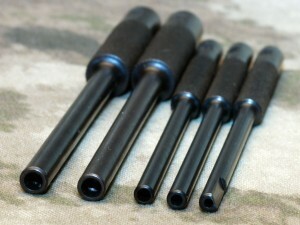 Some manufacturers utilize the roll pin method identical to the Armalite AR-10. The process of installing the Bolt Catch Pin is probably one of the most difficult tasks for the inexperienced to perform. Not done properly it’s easy to damage the finish of your lower or worse, break something. Fortunately a little grease, a roll of masking tape and some special roll pin punch make it easy. 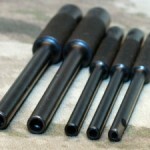 Visit our AR-10, 308 AR Roll Pin Tools Page. 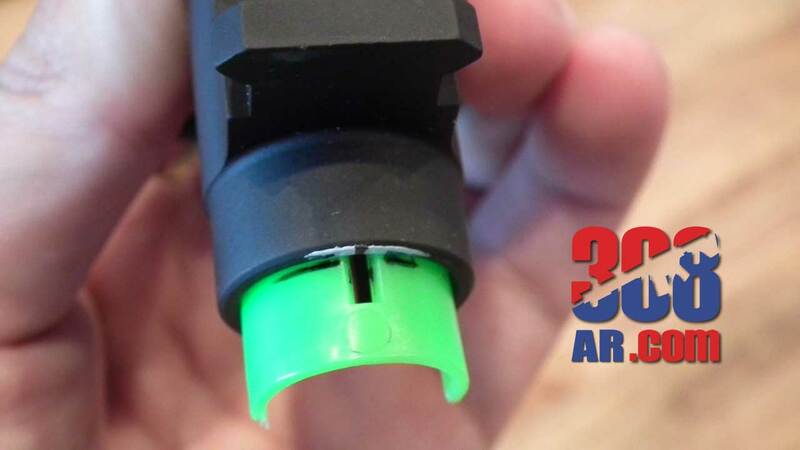 308AR AR15 AR-10 Roll Pin Tools – One of my pet peeves from folks who assemble their own AR15 AR-10 308 AR rifles is the sloppy installation of the various roll pins the rifles require. In all fairness there are a few roll pins that present a challenge to the inexperienced and experienced alike. The BOLT CATCH ROLL PIN comes to mind as does the FORWARD ASSIST ROLL PIN. The BOLT CATCH ROLL PIN is positioned quite close to the body of the LOWER RECEIVER and requires a ROLL PIN PUNCH to have a flat side to properly install. I have searched the internet shooting forums and websites as well polled user of my own forums for a better way to install roll pins. In that search I found some creative approaches but nothing that worked any better than my own approach of taping a ROLL PIN to a ROLL PIN PUNCH. Well that was then this is now. Brownells offers a ROLL PIN STARTER SET they refer to as ROLL PIN HOLDERS. The pins are available individually or as a set for just under $50. I opted for the set. The roll pin holders are genius. As seen in the image above the ROLL PIN HOLDERS are simply a punch that has a hollow tip the diameter of a given roll pin. Place the ROLL PIN in the correct ROLL PIN PUNCH HOLDER and with a plastic faced or brass hammer carefully tap in the ROLL PIN. To prevent damage to the the WEAPON stop hammering before the ROLL PIN HOLDER contacts the part that accepting the ROLL PIN. At that point switch to a regular ROLL PIN PUNCH, the type with a half round nose and finish driving the ROLL PIN flush. For finishing the BOLT CATCH ROLL PIN INSTALLATION I suggest the BOLT CATCH PIN PUNCH from Brownells. It is almost entirely flat on one side making installing the BOLT CATCH ROLL PIN the rest of the way a breeze. The Brownells Roll Pin Holder Set holds roll pins perfectly aligned for starting correctly. Especially good on the tiny, tough-to-grab ones, or those in tight places. 1/16″ is notched to clear M16/AR-15 rear sight. 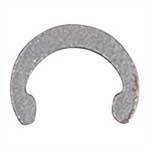 3.5mm excellent for holding the pin that retains the breech block on Sig handguns. Finish driving with roll pin punch. O/A in chart means “Overall”. Available individually or as a set of 5. The Brownells Bolt Catch Pin Punch is a specially made, slab-sided punch clears left side of the magazine well allowing bolt catch pivot pin to be removed by driving it to the rear.